Russia has sought detailed information from India on complaints over alleged dilution of the speciality tag for Darjeeling, Assam and Nilgiris teas. The speciality tag known as Geographical Indication (GI) is given to products made or originating from a specific region as recognition of its unique qualities attributable to that particular region, Russian Embassy reports quoting Business Line. Several Indian tea makers had lodged complaints against alleged dilution of GIs of Darjeeling, Assam and Nilgiris teas through “mixing of these teas with other varieties” in Russia. The issue was taken up at an India-Russia bilateral meeting on the sidelines of the recent BRICS Summit. Mr Kaushik Basu of the Darjeeling Tea Association said Russia had no specific legal protection for these GIs. The matter is now being taken by the Tea Board that has already sent some samples, he said. The Tea Board has been fighting many cases on the GI protection, especially against the illegal use of the word ‘Darjeeling Tea' and the infringement of this intellectual property right in several countries, including Russia. Mr Basu said the GI for Darjeeling tea has been registered in India and Europe. At the bilateral meet, India wanted Russia to consider GI protection for these tea varieties under their collective trademark law till Moscow enacts legislation for granting legal protection to GIs. Russia has assured India that it will look into the complaints, but wanted more details. The increasing focus of the Indian tea industry on the lucrative Russian market is mainly due to the fall in shipments to one of its major markets, Iran. Iran is currently hit by the sanctions being imposed on it by the US and EU. Indian exporters have also turned more to exporting value-added and branded tea as well as marketing their brands overseas instead of exporting tea as a plain commodity. 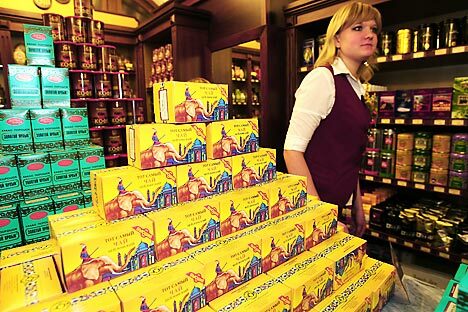 Russia, the UK and the UAE are among the major importers of Indian tea. Russia is the world's top tea importer, while India's major export competitors include Sri Lanka and Kenya. In a related development, Moscow has agreed to look into India's complaints on duty differential between bulk and packaged tea, as well as customs regulations that are major barriers for Indian tea exports to that country.